Aptly named, this era comprised a series of unfortunate events. The Vienna Stock Exchange fell. The Coinage Act of 1873 demonetized silver, pushing investors away from making long-term loans. U.S. banks collapsed twice, causing the Panic of 1873 and the Panic of 1893. But three startups - the Tabulating Machine Company, the International Time Recording Company and the Computing Scale Corporation - developed technologies during this 23-year period that were in demand despite the sour economy. A time clock for recording workers' hours, for example, was needed as industrial production at the end of the century surged. Also, a tabulating machine was vital during the immigration wave, to tally up the expanding population. 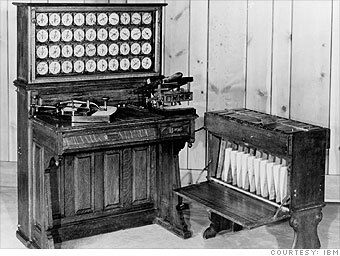 These three companies merged in 1911 as the Computing-Tabulating-Recording Company, which changed its name to IBM several years later. Status today: If it's true that what doesn't kill you makes you stronger, IBM came into this recession well-fortified: Big Blue is a veteran of near-death experiences. IBM's wild success in the 1960s led to antitrust action by the U.S. Department of Justice. The fallout from U.S. v. IBM took its toll over the next decade and radically reshaped IBM's business operations. IBM eyed oblivion again in the early 1990s, as its traditional hardware and mainframe computing business dried up. Under Lou Gerstner's leadership, IBM overhauled its business model, shifting the emphasis from products to services. Although consumers are spending less on technology in the current economy, IBM had record revenue of $103.6 billion last year. Still, the downturn is taking its toll. IBM has laid off thousands of employees in its software and services units this year.